Abdul Majeed Dandis is a member of the GMJ International Central Committee. 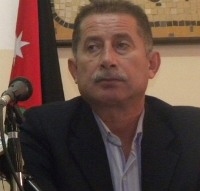 He is a member of the political bureau of the Jordanian Democratic Unity Party (Hizb al-Wahdah al-Sha’biah al-Dimuqratiyya al-Urduni) which was formed in 1990 and has its roots in the Jordanian branch of the PFLP. Its slogan is “For a democratic national Jordan and the recovery of the legitimate national rights of the Palestinian people”. He is also a member of the opposition bloc in Jordan.